Did you know? 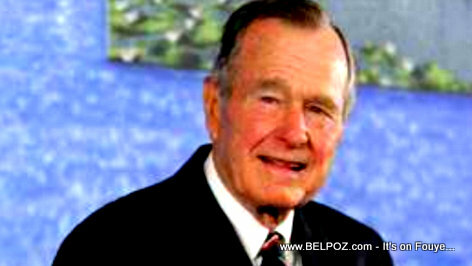 George H. W. Bush was the US president who imposed an Embargo in Haiti back in 1991 to force military coup leaders to restore Aristide to power? "Today, I will not say that Bush is responsible for all of Haiti's problems; however, up until today, we are still suffering from the sequels of the embargo the Bush government imposed on Haiti back in 1991 only to please Jean Bertrand Aristide," journalist Luckner 'Louko' Desir said. Haiti pap janm bliye sa -- Haiti will never forget this, he said. Back in 1991, the Haitian economy was very precarious compares other economies in the region, the journalist continued, and, to please a sector, the imposed an embargo to Haiti. While the embargo was to force the Haitian military to restore Aristide to power, but it was not the military who felt the embargo. Besides, if the Americans did not support the coup d'Etat it would've never happened. Above all that, the Bush administration imposed the embargo on Haiti and we are still paying the consequences of this embargo. K.M.and his peoples will destroy that country. Everyone is to be blamed. Si andan kay pa vann ou deyò pa ka achtew. We are always looking to cst blame for our own actions. Our leaders dint provide the most basics in term of unfracstructures to the country...I dont think the embargo of 1992 was the essential cause.